Evan Zhu wasn't awarded a wild card into Kalamazoo this year, which was unfortunate, given that he had an ATP point and was having success in Futures qualifying most of the year. 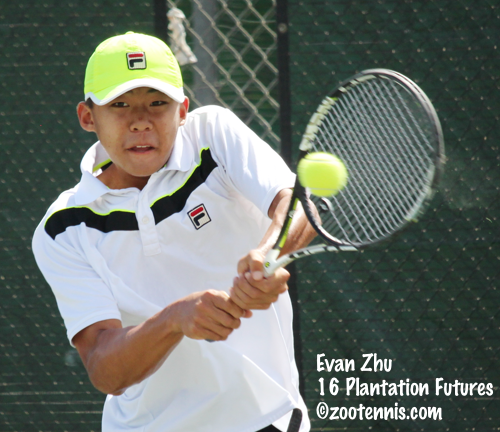 Ready to start his freshman year at UCLA next week, Zhu has added at least 10 ATP points to his resume after today's 7-6(2), 6-1 win over Alex Blumenberg of Brazil at the $10,000 Claremont, California Futures put him in his first Pro Circuit final. The 18-year-old qualifier, who trains at the Dent Academy, will play former Pepperdine All-American Sebastian Fanselow of Germany in the final. Fanselow spoiled an all-UCLA final by outlasting wild card Martin Redlicki 4-6, 6-4, 7-6(4) in a two-and-a-half-hour semifinal battle. In the doubles final on Friday, Fanselow and Sebastian Bader of Austria, the No. 2 seeds, lost to top seeds Luis Patino of Mexico and Alexios Halebian 7-5, 6-4. US Open girls finalist Viktoria Kuzmova had no time to relax after her run in New York, heading directly to the $25,000 Lubbock tournament, where she is the No. 2 seed. The 18-year-old from Slovakia did get a Wednesday start, and the heavy schedule appears to be agreeing with her, as she has reached Sunday's final, where she will play 18-year-old Freya Christie of Great Britain. Christie, the No. 5 seed, beat 17-year-old qualifier Ashley Kratzer 7-6(2), 6-2 in today's semifinal, while Kuzmova beat unseeded Ana Veselinovic of Montenegro 6-2, 6-2. The doubles title went to Catherine Harrison and Emina Bektas. Harrison, a recent UCLA graduate who is now a volunteer assistant at TCU, and Bektas, the 2015 Michigan graduate, were unseeded, but didn't lose a set in their four victories. They defeated No. 1 seeds Ema Burgic Bucko of Bosnia and Renata Zarazua of Mexico 6-3, 6-4 in the final. Burgic Bucko is a former Baylor star. Melanie Oudin has reached the final of the $50,000 tournament in Atlanta, where she will face top seed Elise Mertens of Belgium. Mertens defeated Kristie Ahn 7-6(9), 6-4 to prevent the all-US final, while Oudin took out US Open girls quarterfinalist Tessah Andrianjafitrimo of France 6-4, 6-1. Eighteen-year-old Ingrid Neel won her sixth USTA Pro Circuit doubles title with her fifth different partner in Atlanta. Neel and Pepperdine sophomore standout Luisa Stefani of Brazil defeated Taylor Townsend and Alexandra Stevenson 4-6, 6-4, 10-5 in the final. At the $50,000+H ATP Challenger in Cary, North Carolina, Ernesto Escobedo will face James McGee of Ireland in Sunday's final. For the second time in three months, Escobedo defeated Frances Tiafoe in a third set tiebreaker. The previous time was the final of the Lexington Challenger; today it was the semifinals in Cary, with Escobedo taking the victory by a 6-3, 6-7(5), 7-6(2) score. McGee, the former North Carolina State standout, defeated defending champion and top seed Dennis Novikov 3-6, 6-3, 6-3. The $25,000 Futures in Canada was completed today, with Rhyne Williams going one for two in finals. He and Hans Hach of Mexico, the No. 2 seeds, won the doubles title, beating juniors Benjamin Sigouin of Canada and Juan Carlos Aguilar of Bolivia 6-3, 6-3 in the final. In today's singles final, Williams, the No. 7 seed, lost to No. 2 seed Filip Peliwo of Canada 6-3, 6-4. Peliwo, now 22, has struggled on the Pro Circuit since making all four junior slam finals (and winning two titles) back in 2012. This is his first Futures title of 2016, after winning two last year.